Vinilo transparente delantal con manga larga. Cierres de gancho de velcro y trabillas en los puños. Alex Artist Apron w/ Long Sleeves Alex Artist Aprons w/ Long Sleeves protects kids from getting dirty when they're busy being creativity. It's a long-sleeved clear vinyl apron with Velcro hook and loop closures at the cuffs for extra protection. It also has three pockets in the front to keep brushes and other crafting tools. The apron fits almost all kids aged between three and eight years and is easy to clean, too. Why You'll Love It: With this apron, that mess doesn't stand a chance. 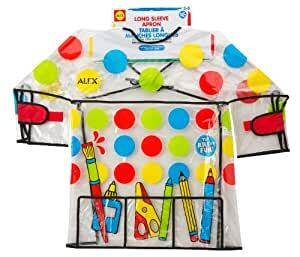 Age: 3 years and up Features Clear vinyl apron with long sleeves Velcro hook and loops closures at cuffs Three pockets in the front for storing crafting tools Helps keep kids clean Fits almost all kids aged between three and eight years Very easy to clean Recommended Ages:3 - 7. I bought it because it covers the sleeves but the plastic is quite hard/rigid. After wearing it for 10 minutes, my son refuses to wear it. A una persona le resultó útil.